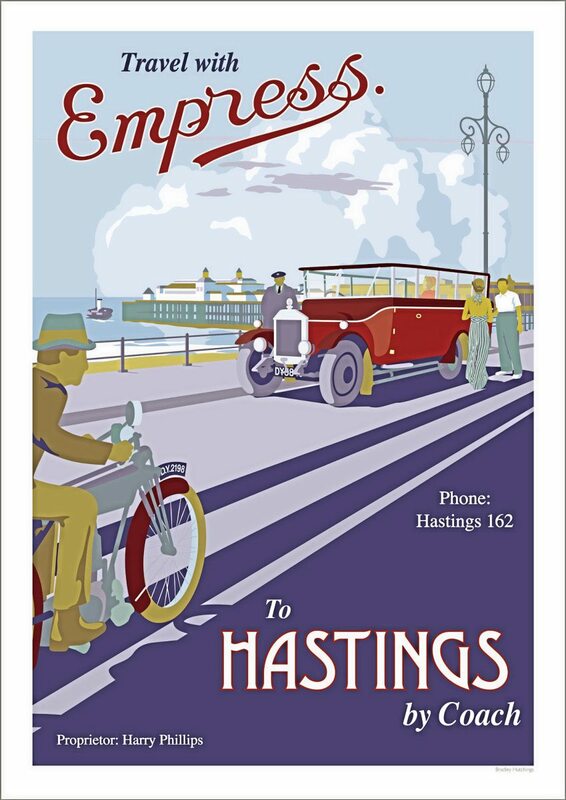 Next year Empress of Hastings will celebrate its 90th anniversary and during that time its familiar carmine and ivory vehicles have become as much a familiar sight in Hastings as the famous fishing net sheds on the beach. But, how has it survived so long? The word that sums it up is ‘adaptability’ – never just sitting back and accepting the status quo but always looking for trends and being ready to make changes while protecting the core operation and giving maximum customer satisfaction. These days the company is run by born-and-bred locals the Dine family, but remarkably during those 90 years it has had only four owners. The origins of Empress lie back in 1929 with a curious character called Harry Phillips. The Phillips family had existed in Hastings Old Town since at least 1754 and were best known for producing top-flight cricketers who played for Sussex Cricket Club. The family, including Harry’s father, another Harry, were involved in the building trade, a lucrative occupation in a rapidly developing Victorian/Edwardian seaside area. Harry was born in 1891 but did not follow his father’s profession; he became an accomplished musician. During the First World War he was invalided out of the Navy and took up his musical career again. In 1919 Harry’s father died leaving a substantial fortune which Harry and his sister Helen inherited on the death of their mother, Patty, in 1929. Harry like his forbears was a keen cricketer and bowls player. Soon after receiving his inheritance Harry bought his first coach. Why did he buy it? Reputedly so he could transport his friends in the cricket and bowls teams to away matches! 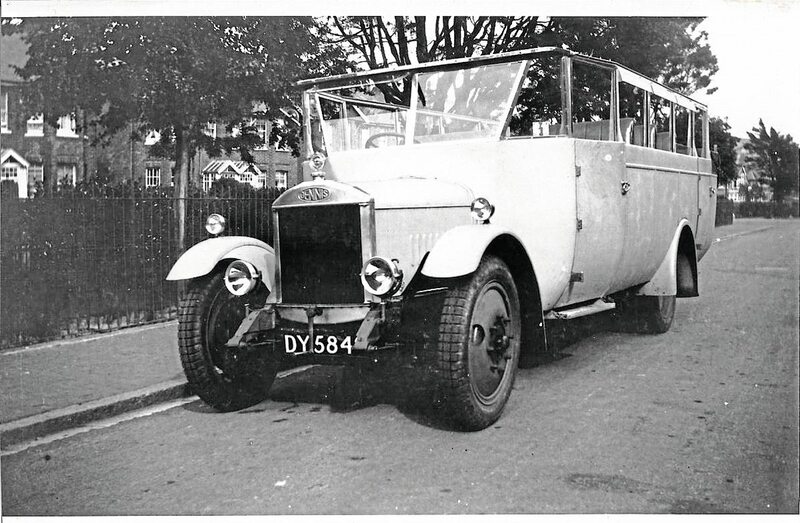 The first vehicle was a brand-new Dennis GL 20-seat charabanc with canvas hood. That Harry wasn’t short of a bob or two can be gauged by the fact that the vehicle he bought was a top of the range coach with ‘all-weather’ full roll-back canvas hood, costing £800. An enormous amount in those days. 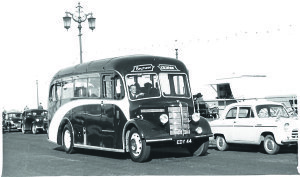 Ahead of the Road Traffic Act 1930 Harry obtained a licence from Hastings Corporation to operate his vehicle on local excursions and ply from the town’s coach ranks on the seafront, changing that to a Road Service Licence in June 1931 making him a bone-fide coach operator. Harry built a garage at the back of the substantial family home Garden Lodge on Edmund Road in Hastings. This was to be the base of operations for many years to come. In those days apart from private hires, most of the work involved excursions, with trips to horse race meetings being particularly popular. Harry never drove the vehicle himself because he had been involved in a very nasty car accident some years earlier. He did ride motorcycles. 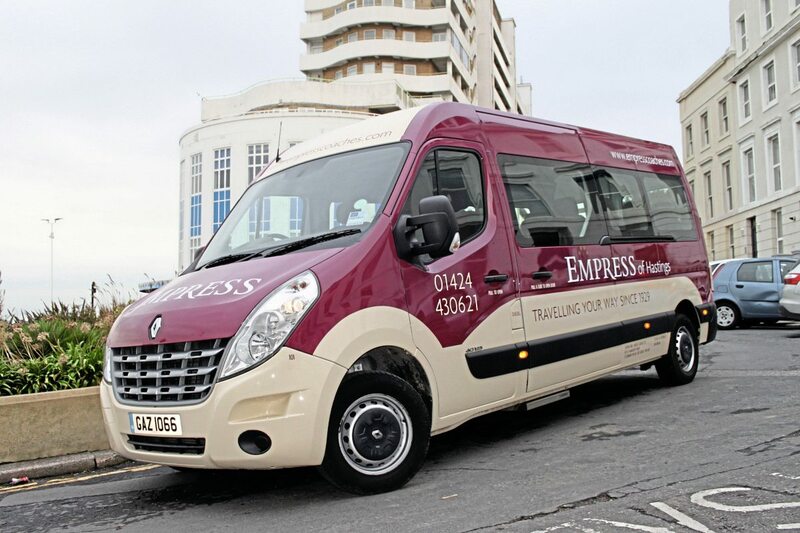 When the name Empress was adopted is not known, but it was common practice in those days to give vehicles names. The first recorded use of the name is a 1934 photograph. This is probably when maroon was adopted as the fleet livery. Why Empress? Probably because Harry thought it put his vehicle ‘above’ local competitors such as ‘Queen of the Glens’ and ‘Star Comfy’. Harry probably also bought the coach to transport the family to Hellingly Hospital – the local asylum where his sister lived for much of her life. The service ran until 1983 including throughout WWII. Just before the outbreak of war Harry bought a second vehicle to replace the Dennis, a 1937 built Bedford WTB with a 26-seat, rear entrance, Willmott Motors body. This was the start of a long association with Bedford vehicles. War saw the tourist trade disappear but Harry soldiered on, literally, being involved in the evacuation of families from the area and also contracts for moving the local Home Guard. Operations were heavily curtailed because of fuel rationing but Harry kept going. At the end of the war things improved. Tourists were allowed back into the area and fuel rationing eased. One of my earliest memories is of this period. My two brothers and Mum and Dad used to go on holiday to this area, travelling from Croydon on a Timpsons AEC Regal III and I clearly remember the line-up of coaches, usually Bedford OBs, on the promenade advertising excursion trips. I probably saw Harry’s coach but my memory doesn’t stretch that far! 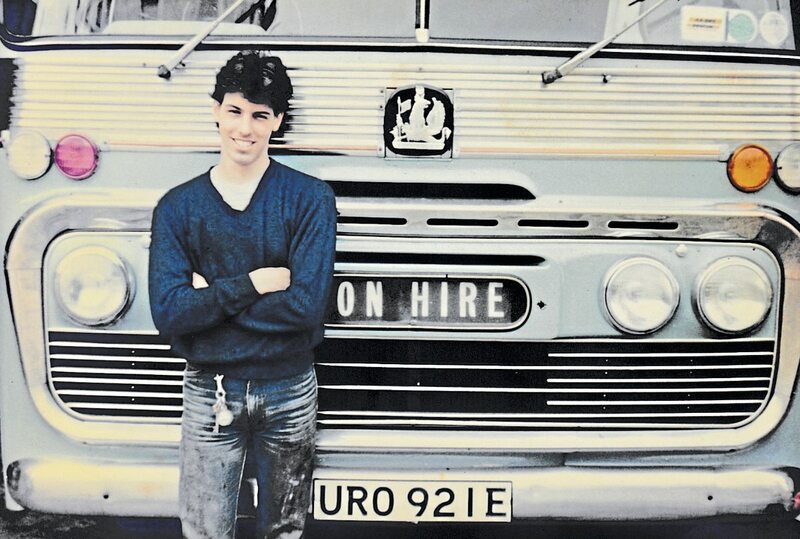 Harry’s son, Harry Edwin, passed his PSV at age 21 and took over driving the vehicle. By 1949 Harry decided he needed an additional coach. He wanted a new Bedford OB with a Plaxton body. Problem, chassis and body supply for the home market was still heavily restricted. Bedford tried to force Harry to have a Duple body. 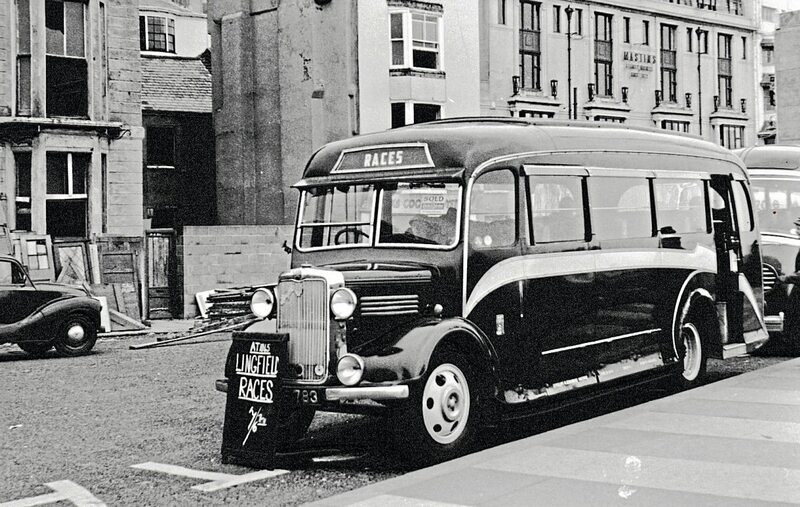 Harry didn’t want that and evidence again that he was well off saw him get his own way, buying the Bedford OB with an M3 Deluxe Sunshine Coach version of the Plaxton body including better quality seats, a linoleum covered floor, heater and a Radiomobile wireless for a cost of £2,012. 10s.0p – £550 more than the cost of the Duple bodied equivalent – remember you could buy a house for well under £1000 in those days! Various different Bedfords joined the fleet over the next few years but they never ran more than two or three vehicles. Throughout this period although tourist work remained a mainstay of operations Harry was very adept at picking up other contract and private hire work. Doubtless his extensive contacts in the local area helped him to hear of potential opportunities. In 1960 to cater for the new bigger vehicles the garage at Garden Lodge was extended and had its roof raised. In 1970 Harry died and son Harry Edwin took over the business, but he preferred driving to running a business and in 1971 he sold the business to another local man Anthony (Tony) Patten although he continued to drive for the company. Tony Patten, who had previously worked for the local Vauxhall/Bedford dealer Coombs Motors, continued to run the business successfully through the ‘70s and ‘80s. 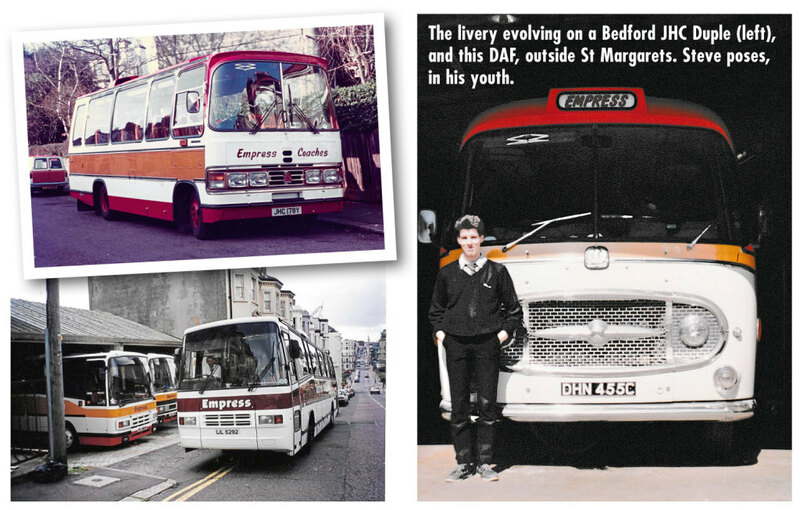 The first diesel powered vehicle, a 41-seat SB3 Bedford Duple, arrived in 1972 and the first 36-footer, a 52-seat Plaxton Bedford VAL arrived in 1973. The fleet had grown to five by 1975. 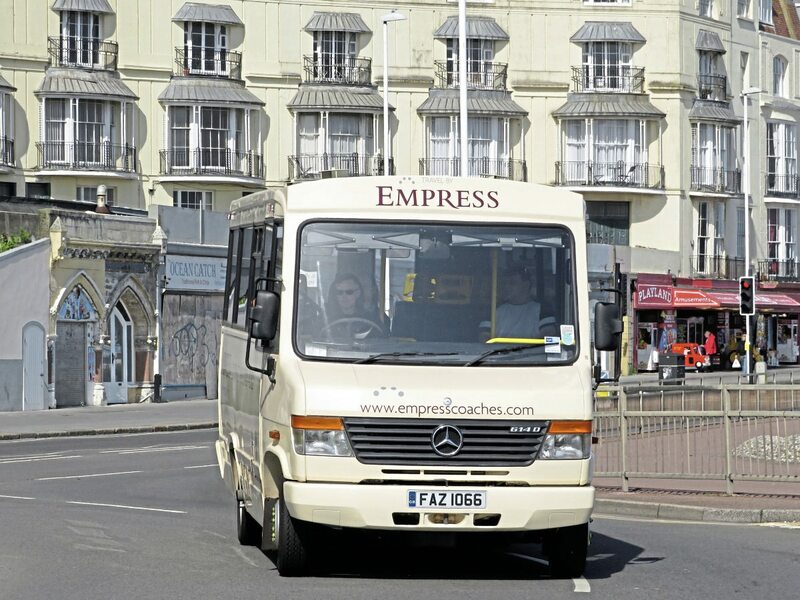 That year there was an unofficial amalgamation between Empress and Pandora Holidays that operated from a garage on St. Margaret’s Road, St. Leonards, just one road back from the Promenade. 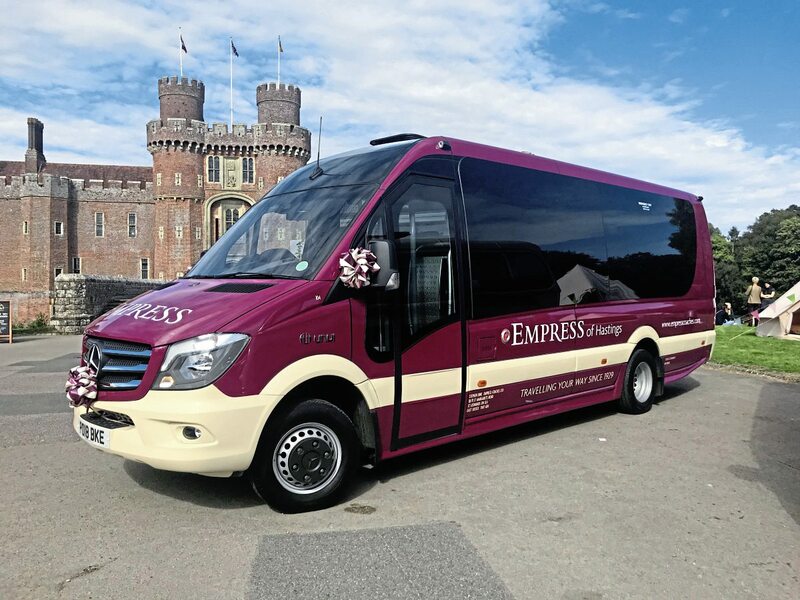 Pandora operated extended tours, private hire, schools and factory contracts which fitted well with the Empress business. The partnership however didn’t work and ended after a year. 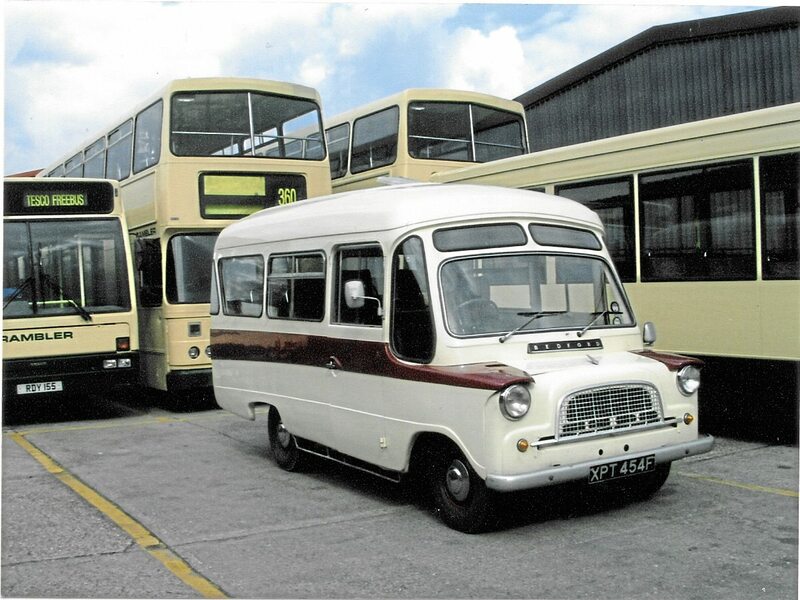 The first minicoach joined the fleet in 1976 when Tony purchased a 12-seat Bedford CF converted by Robin Hood. It was expensive to run and quickly replaced by a Ford Transit. Pandora had ceased trading in 1978 and Tony stepped in and bought the St. Margaret’s Road depot, which remains the company’s base to this day. Even back in the 80s Empress started to notice a reduction in party size and so Tony adjusted the fleet accordingly. 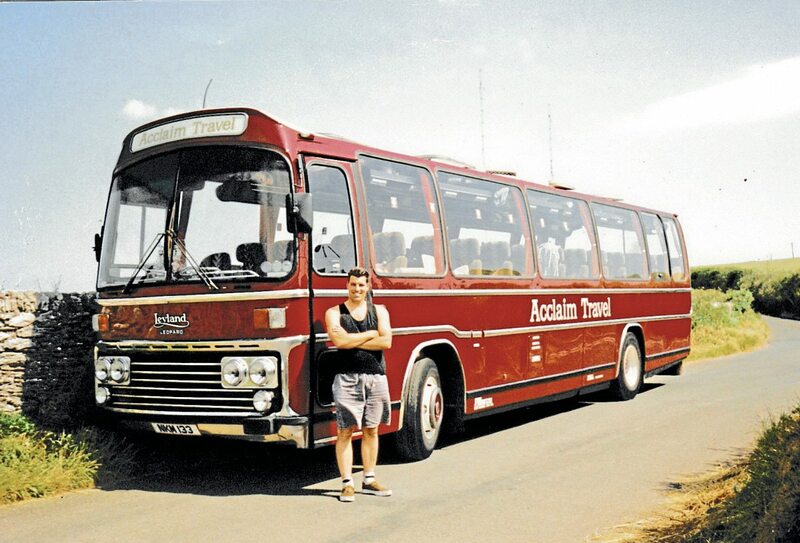 1988 saw the first heavyweight coach, a Leyland Leopard with 53-seat Plaxton Supreme body originally new to Midland Red and in 1989 a Bristol LHS with 35-seat Plaxton Supreme joined the fleet. That ability to spot possible opportunities, which old Harry had shown continued, notably by Tony seizing on the interest in the building of the new Channel Tunnel and becoming a supplier of trips to the visitor centre at Cheriton. Another opportunity came from East Sussex County Council who approached Tony to run wheelchair accessible services for the Glyne Gap special school. A twist in the contract was that they wanted vehicles with easy wheelchair access, i.e. no lifts. 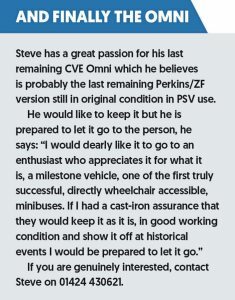 Having studied the few available vehicles on the market, he settled on buying two new CVE Omnis with 21 seat bodies and wheelchair loading through the rear via lowering suspension and a fold out ramp. Tony specified the recently introduced 3.0litre Perkins engine four-speed ZF transmission version. Thus began a long, long association between Empress and the Omni. The original Garden Lodge garage was closed in 1991 and all operations were centred on St. Margaret’s Road. In 1995, a third second-hand Omni joined the fleet. This had had modifications introduced by Kent County Council, easily the most prolific operator of the Omni, with revised hub drives and the Quaife six-speed gearbox. 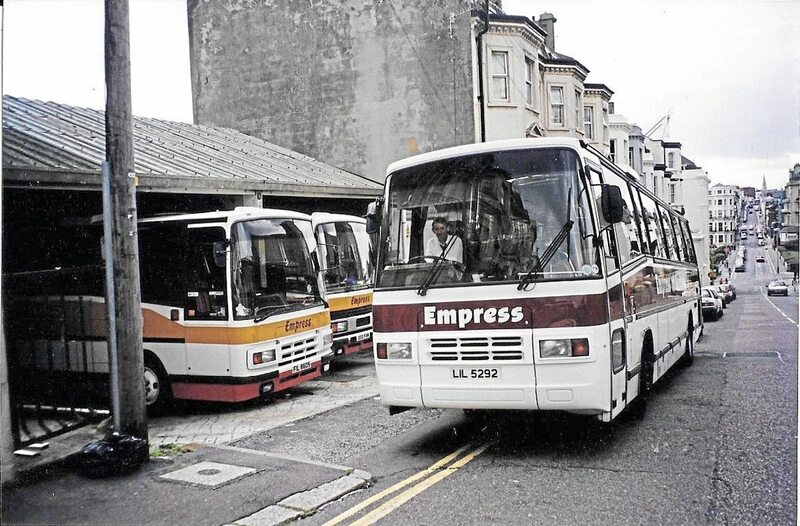 In 1998 Tony decided to retire and sold Empress to Jan Auer, a local businessman. Jan owned a large private school at Guestling and had formed Blackridge Ltd a coach operation to carry his pupils. 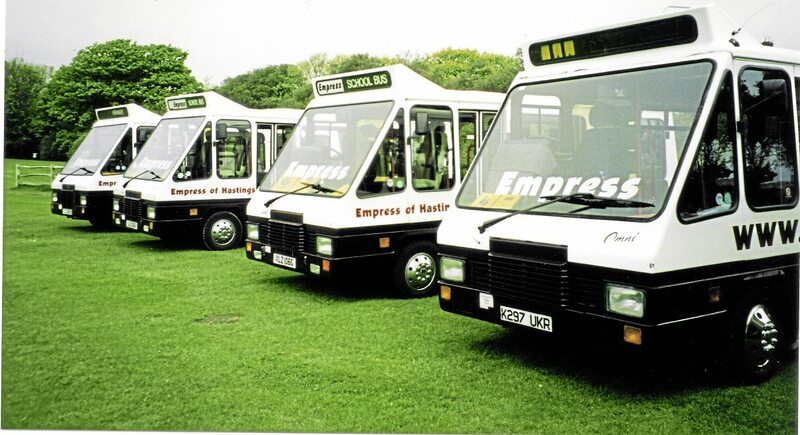 Soon after buying Empress, Blackridge was re-registered as Empress Coaches Ltd. Blackridge brought to the ‘new’ business an ex-Premier Albanian Leyland Tiger Plaxton Supreme VI GT, two Ford Transit minibuses and an ex-Empress Bedford PJK making the total fleet strength 11. 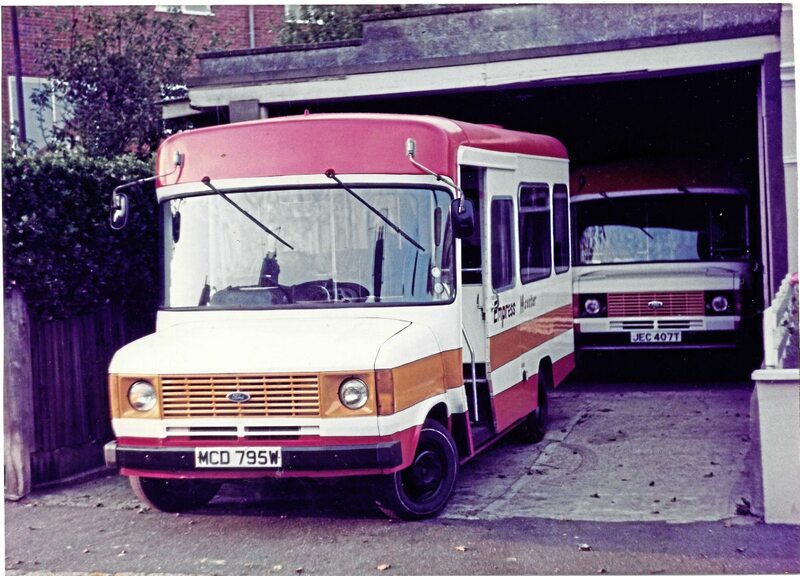 Way back in 1971 Tony Pattern had adopted a fleet numbering system starting with 1 for the old OB, with each new addition to the fleet adopting the next sequential number. 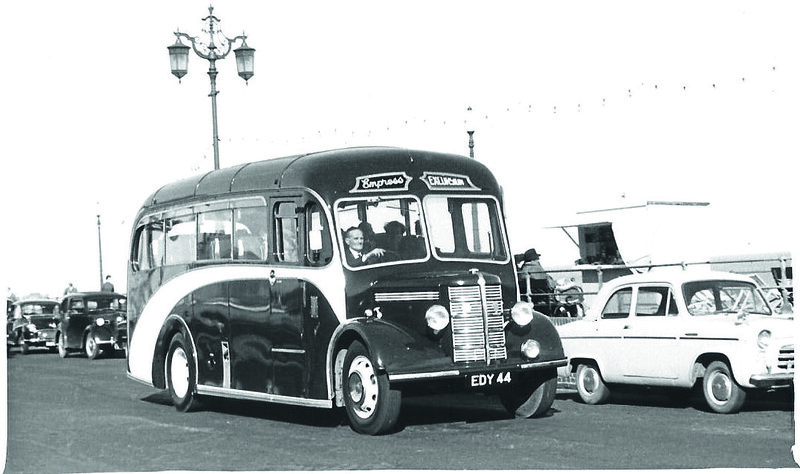 The ex-Blackridge vehicles became 45 – 47 but the Bedford reverted to its previous Empress number of 39! Jan was too busy with his other interests to run Empress so he appointed a Transport Manager, a young chap called Stephen (Steve) Dine. 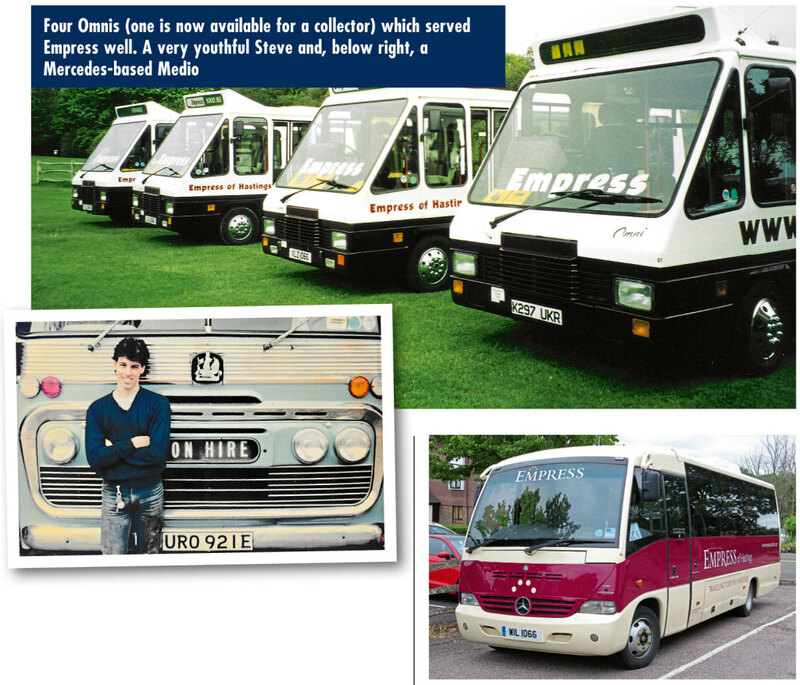 At the end of 1999, Steve bought Empress Coaches from Jan Auer. Not doing anything by halves, two days later he became a father when wife Jayne gave birth to Joshua! 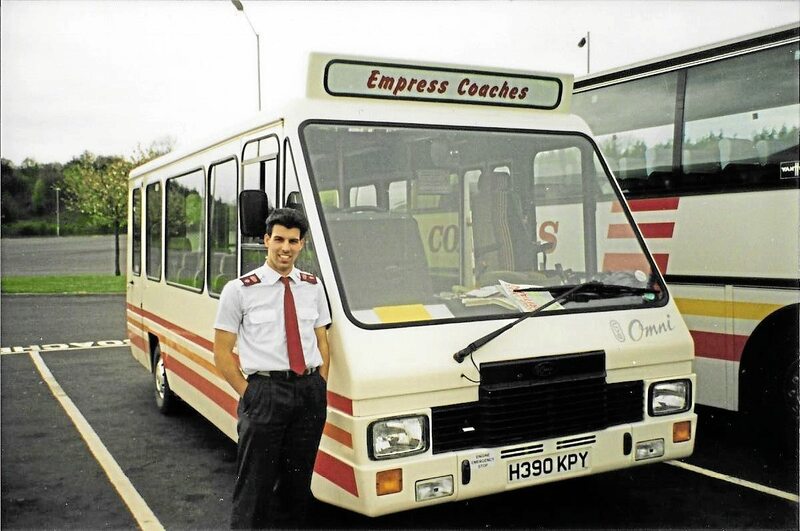 Steve became interested in Empress around 1982 when vehicles regularly ran passed his home employed on a shoppers Christmas service to the new Debenhams Store in Hastings. 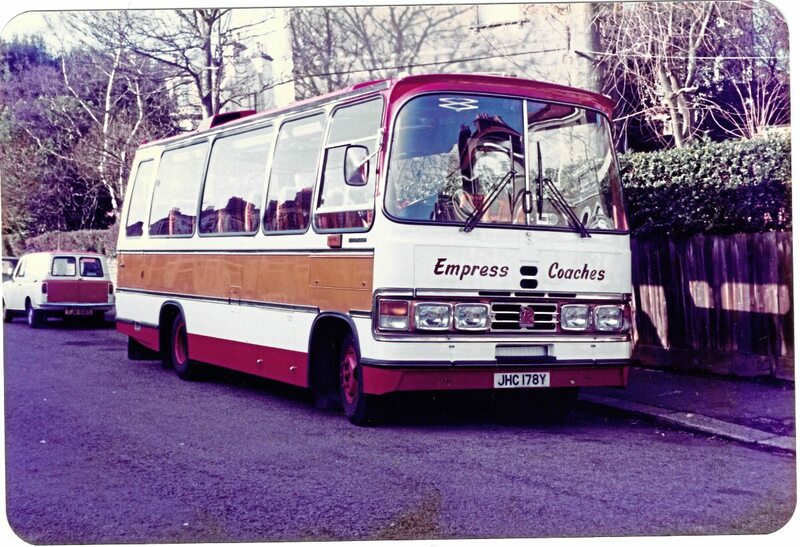 Attending Hillcrest Secondary School in 1983, Steve and his twin brother Paul kept seeing Empress vehicles in the town – he had become a ‘coach spotter’. Soon the brothers were also cleaning vehicles in the evenings and at weekends for some pocket money. 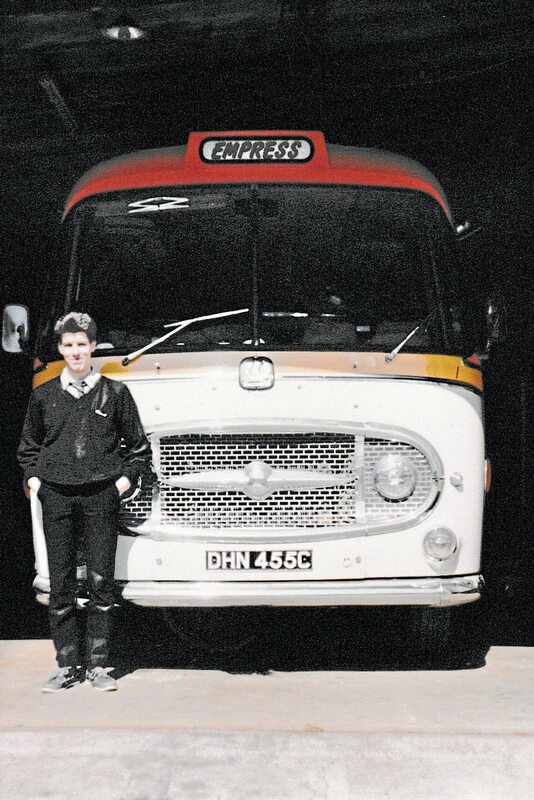 After finishing the course he obtained his PSV licence, driving his own ex-Empress 1965 Bedford VAS 1. With rare extended chassis providing 33-seats in its Plaxton Embassy body. He was just 18. He’d bought the coach off Tony in 1986. He left Empress in 1990 but re-joined in 1991. Stretched finances saw him sell the VAS, something he still regrets. 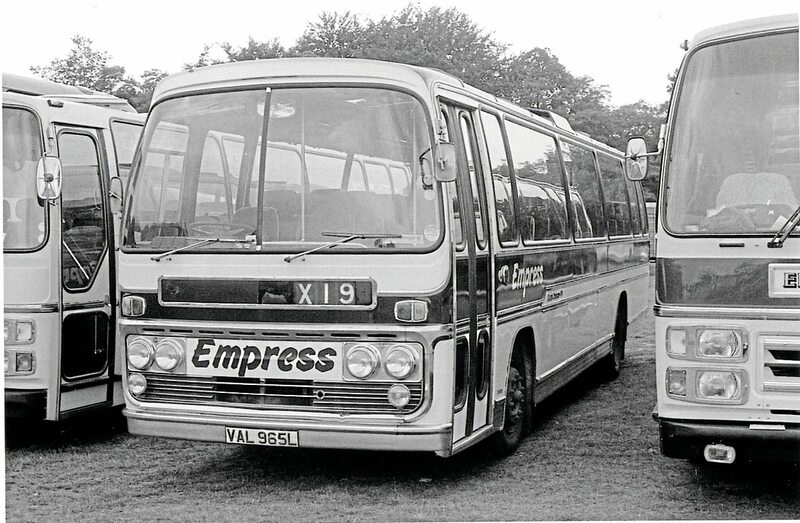 Steve stayed with Empress until 1995 when with Tony’s blessing he started on his own as Acclaim Travel with an ex-Empress Leyland Leopard. Hard work, but massive experience. The Leopard gave way to an ex-Maidstone & District Leyland Tiger. However, by the end of 1997 it was getting more and more expensive to maintain and with the ever-rising cost of fuel, Steve decided enough was enough as an owner driver relying on just private hire bookings. Fortunately Tony offered him back his old job as Mechanic/Driver and it was in that position that Jan Auer found him after he bought Empress and why he offered Steve the job as Transport Manager. 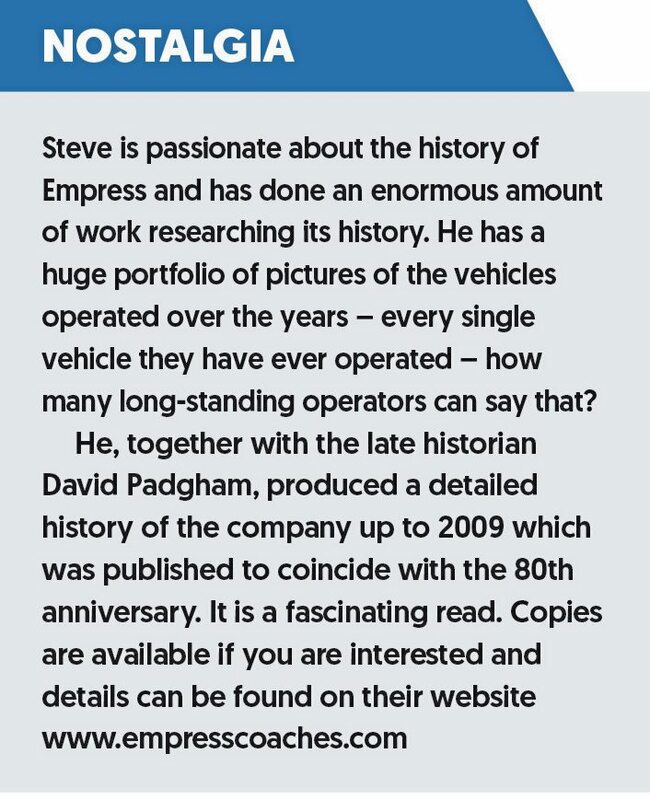 One of Steve’s first actions was to re-introduce the Empress of Hastings name and the carmine and ivory livery. Vehicles also carried the legend ‘Stephen Dine and Son’ but the arrival of daughter Bethany in 2004 saw that scrapped. Peter Pragnell joined to handle the administration. Harry Edwin Phillips and long-time driver Sid Lovell, both no longer driving, were still working at the depot and ready with help and advice. Steve had sold some vehicles, bringing the fleet down to a more manageable seven. By now the largest vehicle in the fleet was a 41-seat Bedford so Steve bought a larger Bedford/ Plaxton from Scotland and Bates at Appledore. This saw the introduction of personalised plates with the purchase of JAZ1066 – “the connection to Hastings and the famous battle was too good to miss,” says Steve. Since then many 1066 plates have joined the fleet. 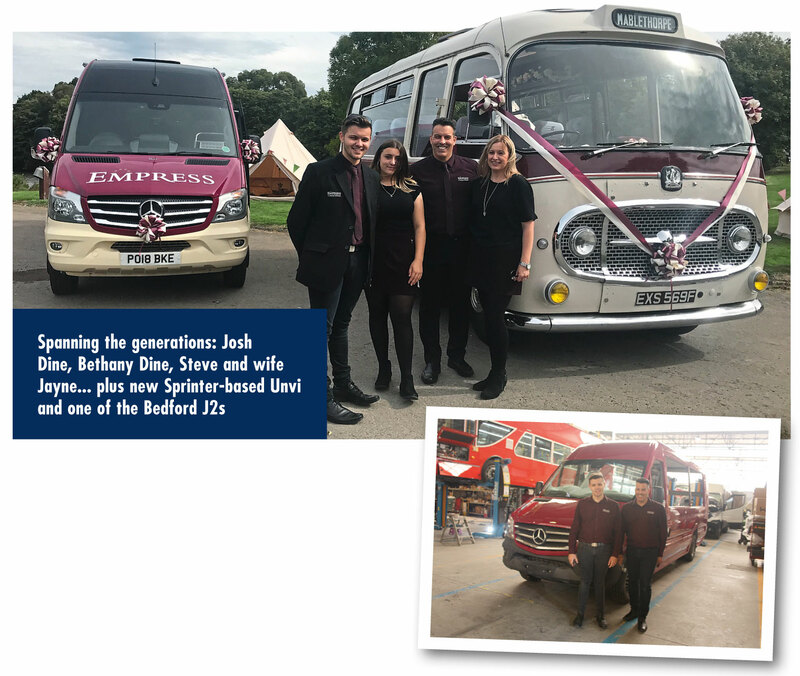 Over the next few years Steve developed the business by keeping a wide band of operations embracing a little contracted stage carriage, private hires, contract work, some excursions, airport runs, all the time building up a reputation for service and quality. Achieving his aim of being the first company in the area people thought of when it came to hiring a vehicle. The fleet remained eclectic with new introductions and departures. Bedfords continued to dominate. 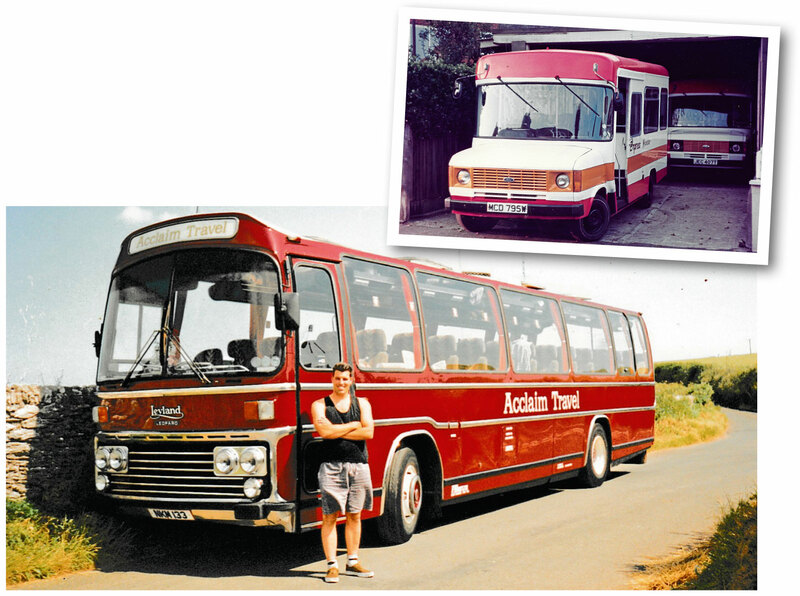 Other vehicles were an Autobus Classique Vario 814 33-seater which came with a fourth CVE Omni. Bought initially for spares it was eventually put back into full service. A more surprising arrival was a Mercedes-Benz 0303 V8 integral. Steve had always had a liking for these vehicles and its large luggage space was a factor. 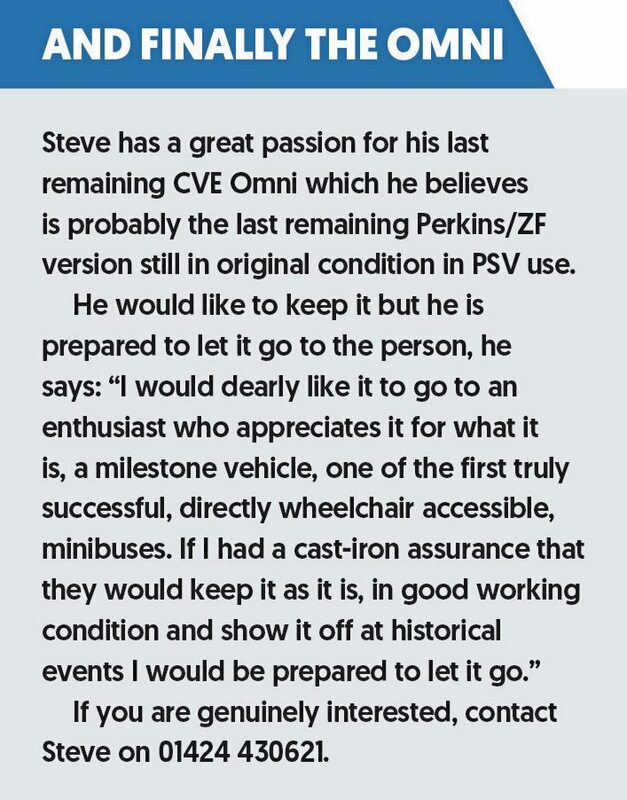 Steve loved driving the vehicle but it was expensive to run and maintain so it had to go. Steve also bought a couple of second hand Optare Aleros which in concept terms were ideal for his wheelchair accessible services. However like most people who operated Aleros, Steve found them a nightmare to keep on the road. Massive difficulties in terms of sourcing parts and the time it took to get them meant their availability was pathetic compared to the Omnis that kept soldiering on, so they had to go. They were replaced by a pair of Ford Transits, not directly wheelchair accessible but a hell of a sight easier to maintain. The down-turn in the national economy in 2008 and its effect on the private hire market caused Steve to take stock. He decided to downsize the fleet. The last full-size coach went as Steve decided the future lay in medium sized (16- and 35-seat) vehicles. He gradually updated the fleet, ever conscious of the developing London LEZ regulations. A great day for Steve was when Joshua (Josh), without any pressure, decided to join the business in 2016. 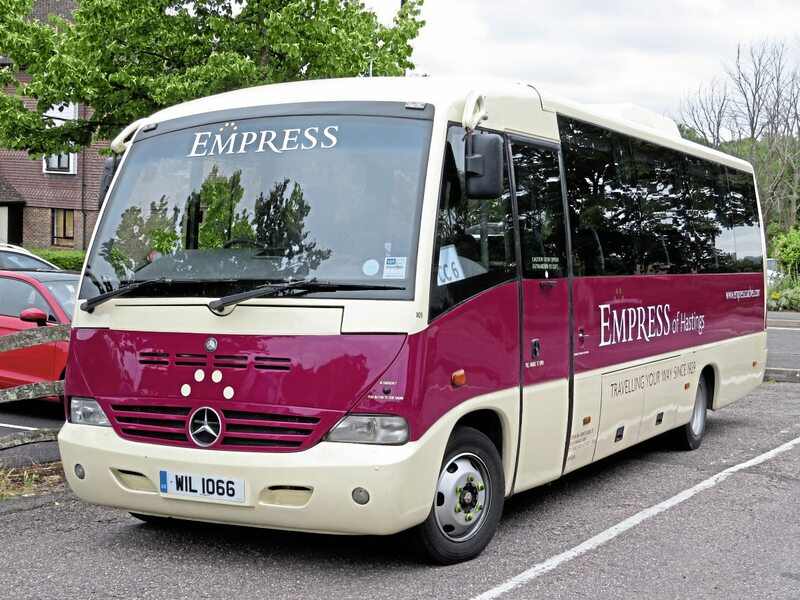 So we come to 2018 with Empress still doing what it has always done best, providing quality transport in its local area. Its gorgeous livery of carmine and ivory remains as familiar to locals as it has been for years. 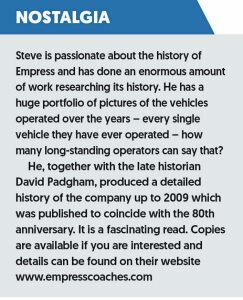 Empress remains a family business with Steve running it, ably assisted by wife Jayne who does the accounts and payroll. Family friend Nikki Fasey looks after day-to-day admin and even daughter Bethany helps clean the vehicles. Josh joined in 2016 as an apprentice, first studying Health and Safety and then going on to study the new GDPR regulations, business skills and communications skills especially as these relate to small businesses. He also found time to train for his PSV licence, passing it when he was just 18 and is now deeply involved with obtaining his Transport Manager CPC for both home and international operation. He has also brought the company right up to date in terms of publicity through his skills using social media. I first met Steve and Josh when I was on a visit to the Unvi factories in Portugal and Spain earlier this year with David McKinless, head of Unvi UK. They were out there with Unvi dealer Steve Taylor to see their first, brand new Unvi being built. Their sheer delight in seeing their vehicle and the care they felt Unvi were taking, is something I will long remember. On the visit to Unvi, Steve was very impressed with this aspect of the production. 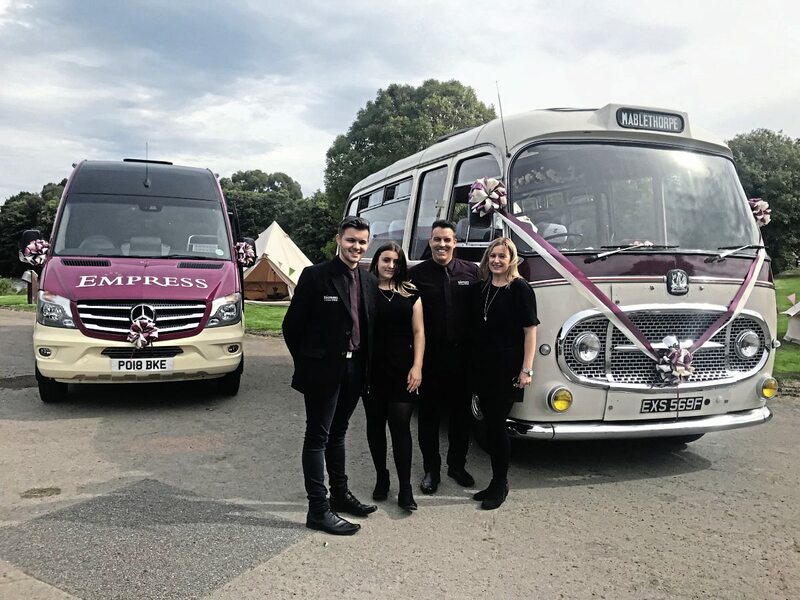 The vehicle in its superb carmine and ivory livery is now in service and Steve and Josh are delighted with how its performing and the reaction from their regular customers. Currently the work programme centres around a range of private educational contracts and a wide variety of private hires. 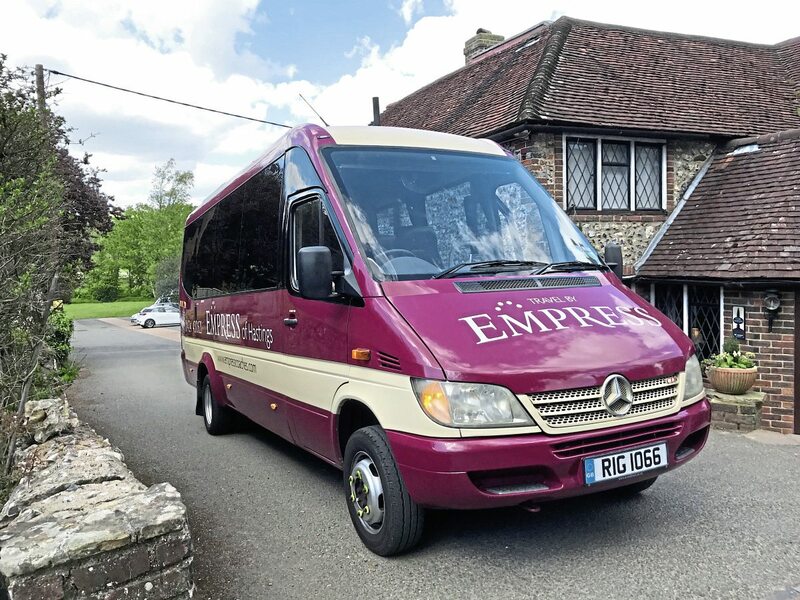 They have also carved out a useful niche in providing specialised transport for weddings and special events and keep a couple of heritage vehicles just for that work. The current fleet numbers eleven. 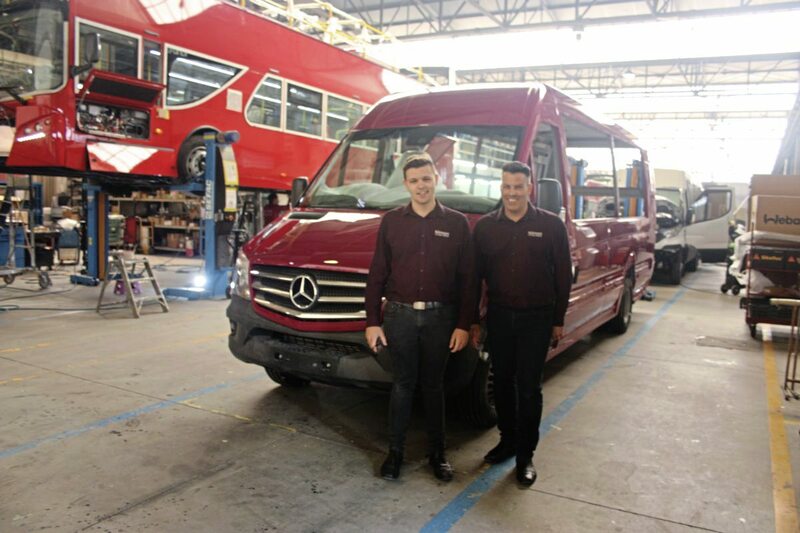 The front-line private hire vehicles are a 28-seat Optare (Ferqui) Toro on the Mercedes-Benz Vario 815; a 16-seat Optare (Ferqui) Sorocco on a Sprinter; a 29-seat Mercedes-Benz Medio on another Vario 815 and a pair of 16-seat Renault Master factory conversions plus of course the new 22-seat Unvi Vega Sprinter 516. 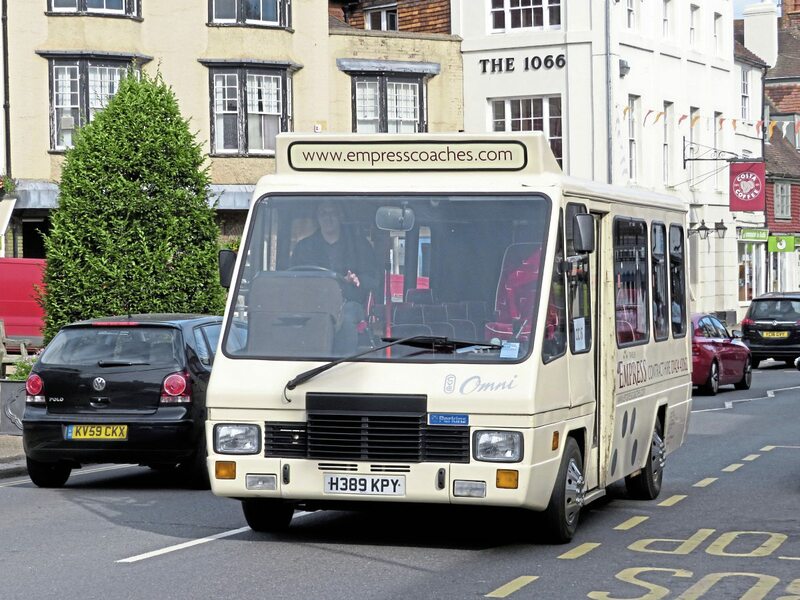 Other vehicles are the last remaining 21-seat Omni; a 12-seat Renault Master Tawe Conversion and a Mellor bodied tail-lift fitted 20-seat Vario 614. 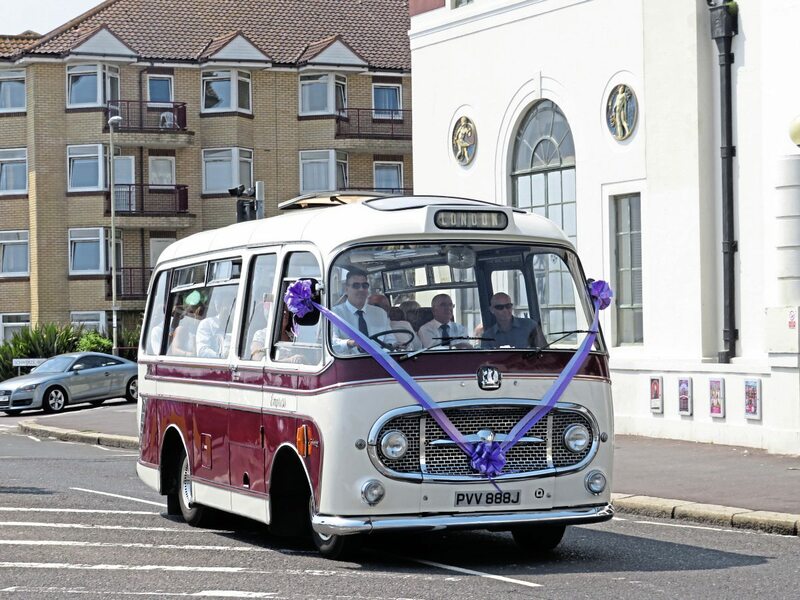 Then there are the two heritage vehicles much booked for weddings; a pair of Bedford J2s with Plaxton 20-seat bodywork. Apart from the two Bedfords and the old Omni all have 1066 plates. The new Vega hasn’t yet joined the 1066 Club but will no doubt do so at some point in the future. When you first arrive at the St. Margaret’s Road depot you can’t imagine running a coach fleet from there. Its frontage is small and opens directly onto a busy road. The site is crammed in between two rows of typical Victorian seaside mansions. It is a surprisingly deep site and has been expanded over the years and Steve and his team of three full-time drivers, six part-timers and four casuals plus himself and Josh are skilled at packing their valuable fleet away into the small space.